This is an update to a report that was originally published on March 22, 2019. 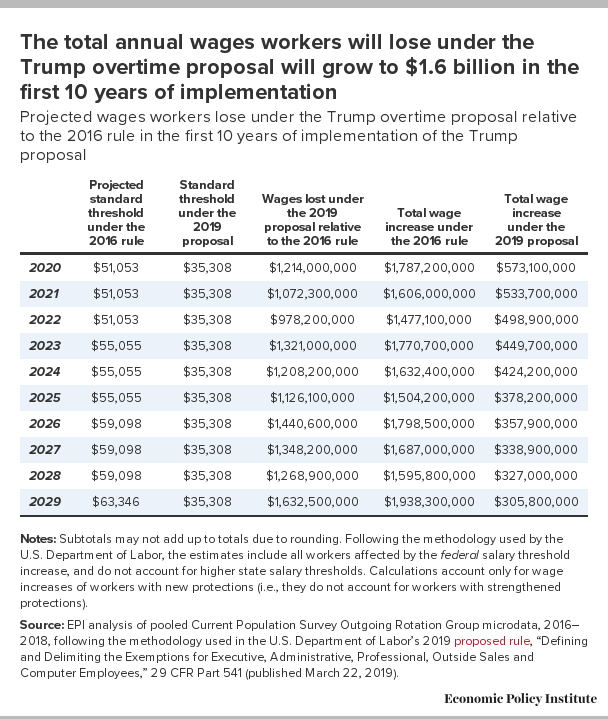 This updated version includes data on wages lost under the 2019 Trump administration overtime proposal that would have been received under the 2016 rule. An estimated 8.2 million workers would be left behind by the Trump proposal. The 8.2 million workers left behind by the Trump proposal include 3.1 million workers who would have gotten new overtime protections under the 2016 rule and 5.1 million workers who would have gotten strengthened protections under the 2016 rule. The 8.2 million workers who would be left behind include 4.2 million women, 3.0 million people of color, 4.7 million workers without a college degree, and 2.7 million parents of children under the age of 18. Because the Trump proposal does not automatically index the threshold going forward, the number of workers left behind grows from 8.2 million in 2020 to an estimated 11.5 million over the first 10 years of implementation. The annual wage gains from workers who get new protections are $1.2 billion dollars less under the Trump proposal than under the 2016 rule. These annual earnings losses will grow from $1.2 billion to $1.6 billion (in inflation-adjusted terms) over the first 10 years of implementation due to the fact that the Trump administration proposal does not include automatic indexing. The 2016 rule, which was held up in court3 following a challenge by business trade associations and Republican-led states, would have increased the overtime salary threshold to $913 per week, or $47,476 for a full-year worker, from its current level of $455 per week, or $23,660 for a full-year worker. It would also have indexed the threshold to wage growth on a triennial basis; under the 2016 rule, the threshold would have increased to roughly $51,000 on January 1, 2020. 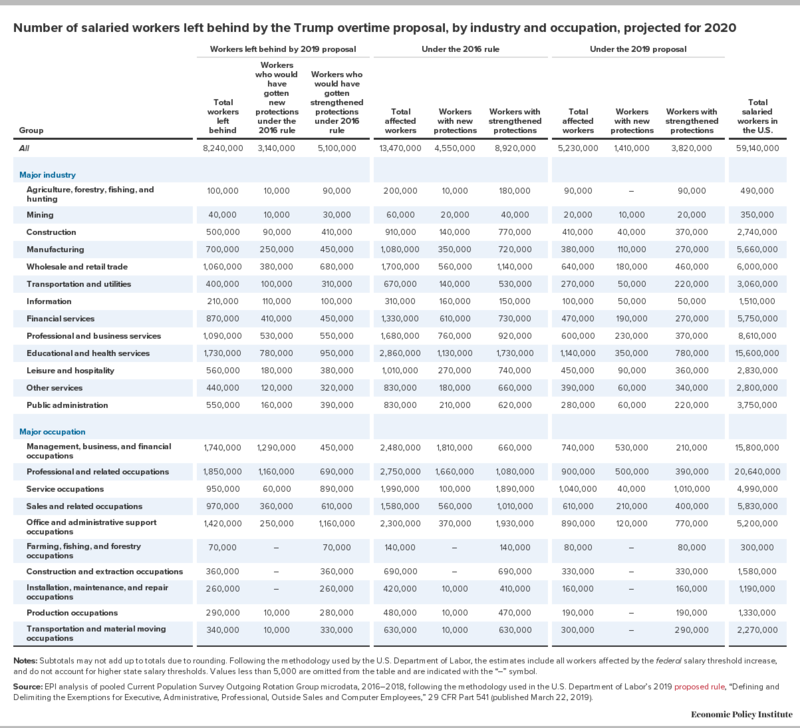 Table 1 shows how many workers will be left behind by the Trump proposal, broken down by by demographic and by whether these workers would have gotten new or strengthened protections under the 2016 rule. For reference, the table also provides the underlying numbers of workers who would have gotten new or strengthened protections under the 2016 rule compared with the numbers who would get new or strengthened protections under the 2019 proposal. 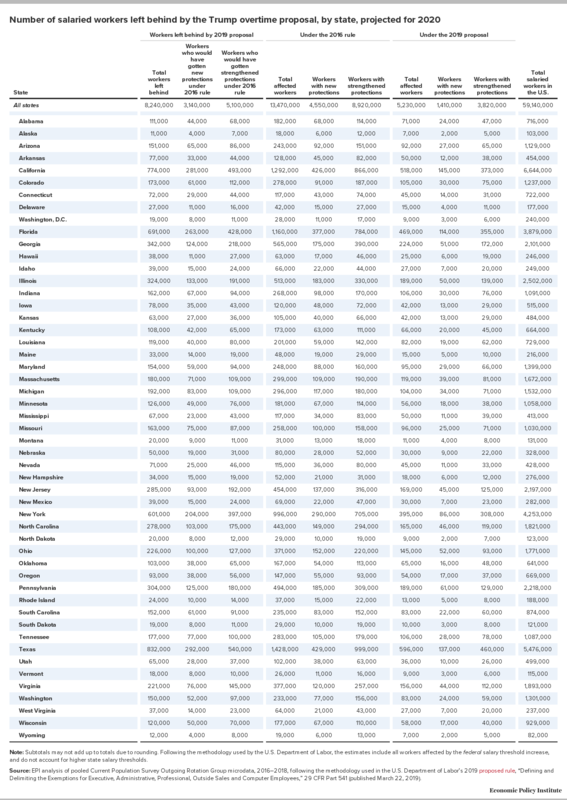 The table shows that the 8.2 million workers who would be left behind include 4.2 million women, 3.0 million people of color, 4.7 million workers without a college degree, and 2.7 million parents of children under the age of 18. The appendix tables provide further breakdowns by major industry and occupation (Appendix Table A1) and by state (Appendix Table A2). The number of workers left behind by the Trump proposal grows over time because the proposal does not include automatic updating, whereas the 2016 rule would have automatically updated the threshold every three years. 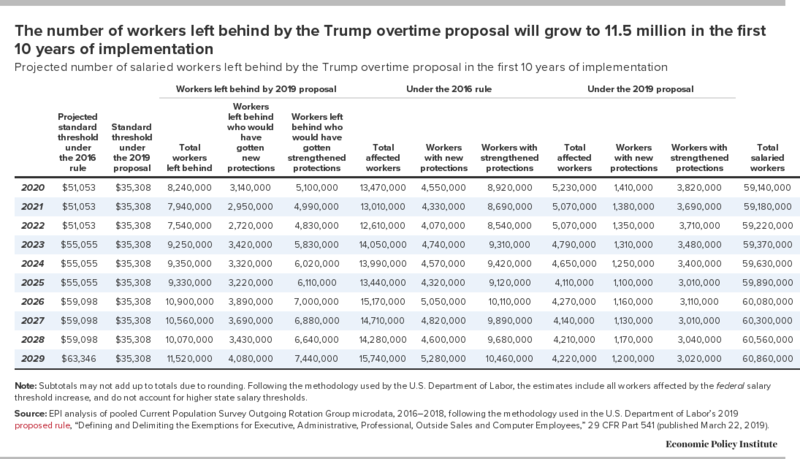 Table 2 shows the increase in the number of workers that would be left behind during the first 10 years of implementation of the Trump proposal. While the department does not assume the threshold will be updated in future years in its own economic impact projections, it is worth noting that the department claims that it is “committing to evaluate” the threshold “more frequently” going forward, in particular mentioning a flexible commitment to notice and comment rule-making to increase the threshold every four years. Given that notice and comment rule-making is extremely time- and resource-intensive—the 2016 rule-making took more than two years—this is an enormously inefficient way for the government to operate (and is why huge stretches of time go by between rule-makings). It makes little sense to go through notice and comment rule-making just to maintain a standard—that process should be reserved for when policymakers want to change the substance of a rule, while automatic updating should be used to ensure that the standard does not erode in the meantime. Further, automatic updating provides crucial predictability for employers. With automatic updating, as opposed to a vague claim that updating will be considered every four years, employers know exactly what to expect and when to expect it. The lower salary threshold of the Trump proposal will translate into lower earnings for workers. Table 3 shows that the annual wage gains from workers who get new protections are $1.2 billion dollars less under the Trump proposal than under the 2016 rule. This calculation includes both wages lost by workers who would have gotten new protections under the 2016 rule but would not get new protections under the Trump proposal, and wages lost by workers who would get new protections under either the Trump proposal or the 2016 rule but who would have gotten a larger raise under the 2016 threshold than under the 2019 proposal. The calculation does not include earnings losses by those who would have gotten strengthened protections under the 2016 rule but would not get them under the Trump proposal. Table 3 also shows that the annual earnings losses grow from $1.2 billion to $1.6 billion (in inflation-adjusted terms) over the first 10 years of implementation due to the fact that the Trump administration proposal does not include automatic indexing. Appendix Table A3 in the appendix provides wage loss breakdowns by state. Notes: Subtotals may not add up to totals due to rounding. Following the methodology used by the U.S. Department of Labor, the estimates include all workers affected by the federal salary threshold increase, and do not account for higher state salary thresholds. Calculations account only for wage increases of workers with new protections (i.e., they do not account for workers with strengthened protections). 2. Defining and Delimiting the Exemptions for Executive, Administrative, Professional, Outside Sales and Computer Employees [final rule], 81 Fed. Reg. 32391–32552 (May 23, 2016).